www.sportseventsmagazine.com June 2018 35 Other surveys show that the interest in the sport only increases at an older age. According to a recent Gallup poll, 37 percent of American adults chose foot- ball as their top sport. selecting it over soccer, basketball, and even baseball. The poll shows the NFL had lost some fans – attendance is down 10 percent – but college football is gaining momen- tum. Gallup reveals that 56 percent of Americans consider themselves college football fans. 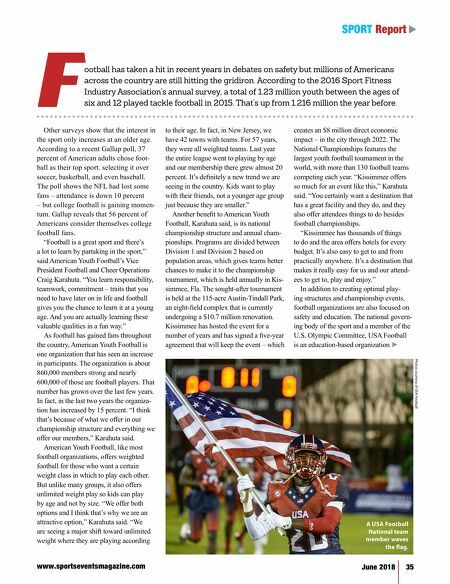 "Football is a great sport and there's a lot to learn by partaking in the sport," said American Youth Football's Vice President Football and Cheer Operations Craig Karahuta. "You learn responsibility, teamwork, commitment – traits that you need to have later on in life and football gives you the chance to learn it at a young age. And you are actually learning these valuable qualities in a fun way." As football has gained fans throughout the country, American Youth Football is one organization that has seen an increase in participants. The organization is about 860,000 members strong and nearly 600,000 of those are football players. That number has grown over the last few years. In fact, in the last two years the organiza- tion has increased by 15 percent. "I think that's because of what we offer in our championship structure and everything we offer our members," Karahuta said. American Youth Football, like most football organizations, offers weighted football for those who want a certain weight class in which to play each other. But unlike many groups, it also offers unlimited weight play so kids can play by age and not by size. "We offer both options and I think that's why we are an attractive option," Karahuta said. "We are seeing a major shift toward unlimited weight where they are playing according to their age. In fact, in New Jersey, we have 42 towns with teams. For 57 years, they were all weighted teams. Last year the entire league went to playing by age and our membership there grew almost 20 percent. It's definitely a new trend we are seeing in the country. Kids want to play with their friends, not a younger age group just because they are smaller." Another benefit to American Youth Football, Karahuta said, is its national championship structure and annual cham- pionships. Programs are divided between Division 1 and Division 2 based on population areas, which gives teams better chances to make it to the championship tournament, which is held annually in Kis- simmee, Fla. The sought-after tournament is held at the 115-acre Austin-Tindall Park, an eight-field complex that is currently undergoing a $10.7 million renovation. Kissimmee has hosted the event for a number of years and has signed a five-year agreement that will keep the event – which creates an $8 million direct economic impact – in the city through 2022. The National Championships features the largest youth football tournament in the world, with more than 130 football teams competing each year. "Kissimmee offers so much for an event like this," Karahuta said. "You certainly want a destination that has a great facility and they do, and they also offer attendees things to do besides football championships. "Kissimmee has thousands of things to do and the area offers hotels for every budget. It's also easy to get to and from practically anywhere. It's a destination that makes it really easy for us and our attend- ees to get to, play and enjoy." In addition to creating optimal play- ing structures and championship events, football organizations are also focused on safety and education. The national govern- ing body of the sport and a member of the U.S. Olympic Committee, USA Football is an education-based organization ► t SPORT Report Photos courtesy of USA Football ootball has taken a hit in recent years in debates on safety but millions of Americans across the country are still hitting the gridiron. 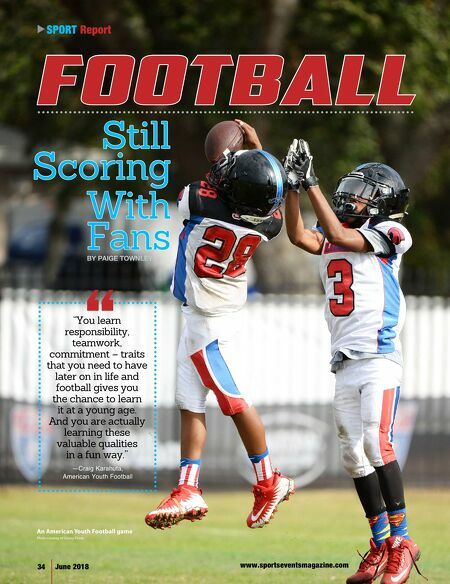 According to the 2016 Sport Fitness Industry Association's annual survey, a total of 1.23 million youth between the ages of six and 12 played tackle football in 2015. That's up from 1.216 million the year before. F A USA Football National team member waves the flag.